Recent television shows, movies, and novels have transported Sir Arthur Conan Doyle’s famous detective, Sherlock Holmes, from the end of the nineteenth century to all manner of places and times, and director Bill Condon’s 2015 Mr. Holmes is no exception. 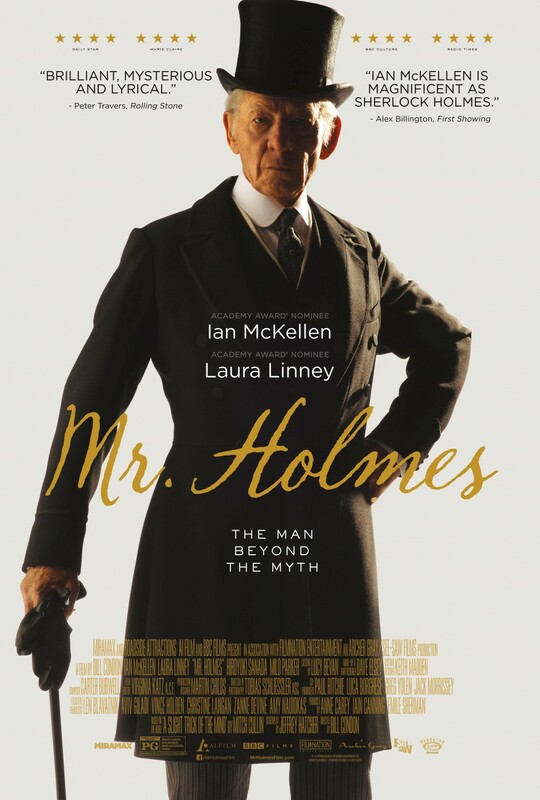 The film begins in 1947, and the audience finds Holmes (played by Ian McKellen) aged, troubled by a failing memory, and retired to a country house in Sussex. There he tends bees, pesters his housekeeper (Laura Linney), and befriends her young son Roger (Milo Parker). However, his country house idyll is disrupted by memories of an unresolved case: the death of a woman mourning two devastating miscarriages. Holmes has located a rare Japanese plant to help restore his memory, but when that remedy fails him, he attempts to untangle the case’s details by calling on his own fragmented recollections and the help of Roger, whose love and knowledge of Holmes’ methods makes him a convenient assistant. The movie—itself an adaptation of Mitch Cullin’s 2005 novel A Slight Trick of the Mind—is an adaptation preoccupied with the pleasures and troubles of adaptation. The plot hinges on Holmes’ ability (or inability) to tell his own story amid other voices trying to tell it for him, and the movie includes sometimes-humorous asides to the misalignment of popular images of Holmes and his identity in the stories themselves. For example, McKellen’s Holmes chuckles at melodramatic film adaptations of his cases, and more than one character wonders aloud about the aged detective’s missing pipe and deerstalker hat. Condon’s movie, then, is an excellent resource for teachers looking to introduce questions of Conan Doyle’s creation as a cultural icon and issues of adaptation and fidelity. While perhaps too long to show during a single class meeting, as it runs just over an hour and 40 minutes, it would be a useful addition as an out-of-class screening or as material for students interested in researching the afterlife of Sherlock. How does Sherlock Holmes exist as a person, a character, and a legend in Conan Doyle’s original stories and in Condon’s movie? Where do these identities overlap? What are the consequences of defining Holmes in one way or another? Some would argue that Holmes’ reputation as a detective relies on his attention to detail and his ability to access the truth through observation. How does Mr. Holmes reinforce or trouble those assumptions? What strategies (narrative, filmic, etc.) does Condon use to represent Holmes’ astute observations, his failing memory, his emotional state? Are these techniques parallels of strategies Doyle uses in his stories? Japan plays a vital role in Mr. Holmes. For example, the movie references throughout the devastations of WWII. How does the film represent Japan and Japanese characters? Do you see these representations as departures from or reiterations of representations of “the East” in Doyle and other Victorian literature and culture? Cunningham, Henry. “Sherlock Holmes and the Case of Race.” The Journal of Popular Culture 28.2 (Fall 1994): 113-25. Leitch, Thomas. “The Hero with a Hundred Faces.” Film Adaptation and Its Discontents. Baltimore: Johns Hopkins Univ. Press, 2007. 207-35. Meslow, Scott. “Film’s 111-Year Obsession with Sherlock Holmes.” The Atlantic (16 December 2011). Web. 30 July 2015. Porter, Lynette. Sherlock Holmes for the 21st Century: Essays on New Adaptations. Jefferson NC: McFarland, 2012. Vrettos, Athena. “Displaced Memories in Victorian Fiction and Psychology.” Victorian Studies 49.2 (2007): 99-107.